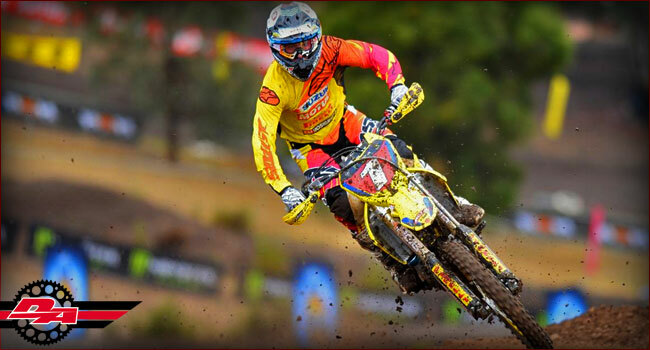 Following the announcement that global energy drink giant – Monster Energy, will partner with the AUS-X Open for 2016, the two have also converged with event partner Yamaha Motor Australia in a nationwide sales promotion, being featured in over 900 Woolworths Supermarkets and 500 Woolworths Petrol Stations. 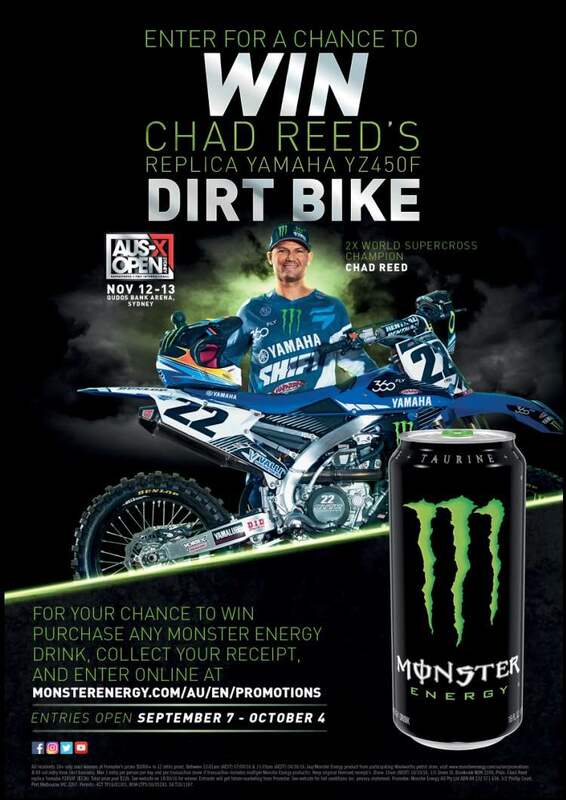 Consumers simply purchase a Monster Energy product from any participating store and complete their entry online (www.monsterenergy.com) for their chance to win a replica Chad Reed Yamaha YZ450F. Monster Energy are also giving away a VIP experience at the 2016 AUS-X Open. Generating mainstream awareness and consequently new fans of supercross in Australia is a key priority for the AUS-X Open promoters and Monster Energy, who have been a strong supporter of the event since it’s inception last year. “This promotion with Monster Energy inside selected Woolworths outlets is absolutely huge. 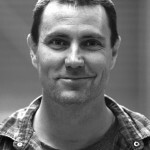 Having a globally recognised brand such as Monster Energy firstly come on board with the AUS-X Open, and then run a nationwide promotion like this to such a mainstream audience is incredible and vital for the sports expansion within Australia,” commented AUS-X Open director – Ryan Sanderson. Monster Energy’s presence will be on the forefront in terms of athletes at the AUS-X Open too, with Ryan Villopoto, Chad Reed, Cooper Webb, Wil Hahn and Kade Mosig all representing the green claw during the supercross action. The Monster Energy rig will also host DJ’s and giveaways during the ‘Pit Party’ which is free to attendees, who are welcome to arrive at any time, to soak up the atmosphere and check out the brand activations, team transporters and grab an autograph from their favourite athlete. 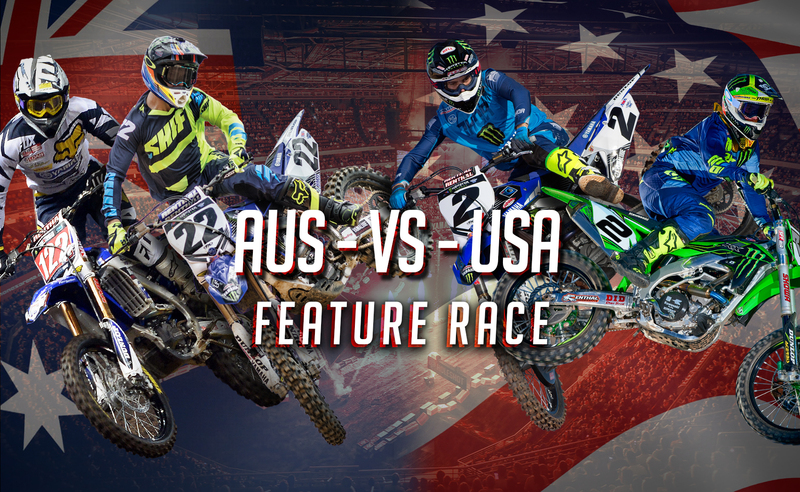 FEATURE RACE & BEST WHIP ANNOUNCED FOR 2016 AUS-X OPEN! 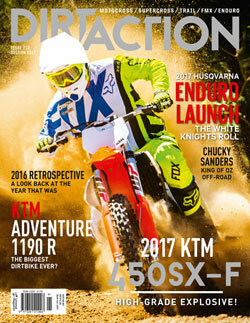 07/11/2016 Damien Ashenhurst NEWS Comments Off on FEATURE RACE & BEST WHIP ANNOUNCED FOR 2016 AUS-X OPEN!